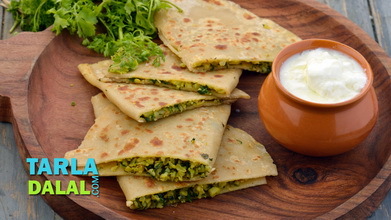 A fabulous stuffing of vibrant broccoli, peppy coriander and gooey cheese makes this paratha a five-star rated delicacy that is sure to thrill your family and friends. 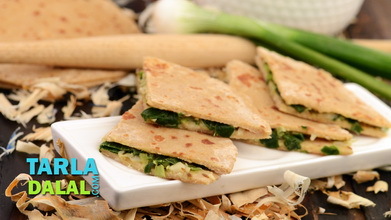 The rustic taste of broccoli goes very well with the mild and nutty taste of cheese, all of which is enhanced beautifully by the addition of coriander. 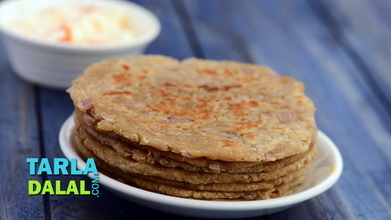 Since the stuffing mixture is coarsely textured, we suggest simply folding the parathas into semi-circles and cooking them as such instead of the traditional way of folding them in and rolling them again, which sometimes leads to leaks! 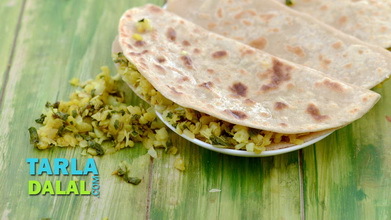 It is also important to cook the parathas with ghee to get a splendid aroma and crisp texture. 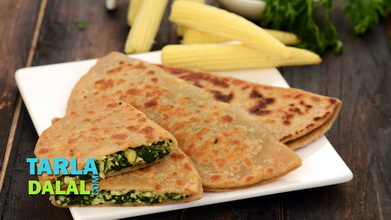 Done the right way, you will find the Broccoli and Cheese Parathas easy to prepare, and also thoroughly enjoy the brilliant mix of textures and flavours in them. Roll out each portion of the dough into a 175 mm. (7") diameter thin circle using a little whole wheat flour for rolling. 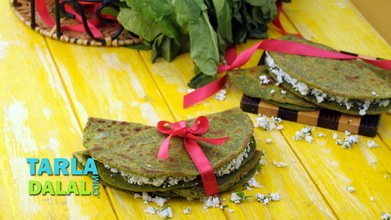 Place 1 portion of the stuffing on one half of the rolled circle and fold it over to make a semi-circle. Press it lightly to seal the edges. 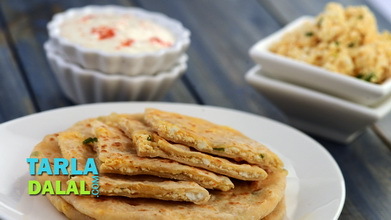 Heat a non-stick tava (griddle) and grease it lightly using little ghee. 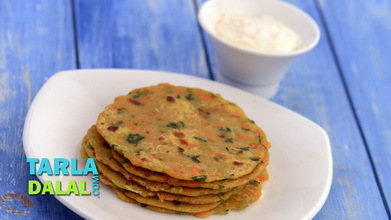 Cook the paratha, using a little ghee, till golden brown spots appear on both the sides. 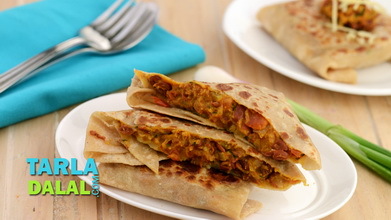 Repeat steps 3 to 5 to make 2 more parathas.